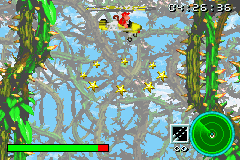 Aerial Loop is the first Funky's Flights mission in the Game Boy Advance port of Donkey Kong Country 2. It can be played in Gangplank Galleon. Diddy Kong must fly the Gyrocopter through twenty rings of stars to reach the helipad at the end. The area is surrounded by bramble walls, similar to the ones found in Bramble Blast and Bramble Scramble. Spider web balls are also shot through the air from offscreen. If the Gyrocopter comes in contact with either obstacle, it gets damaged. If Diddy makes it to the helipad, he completes the mission. "This is a piece of cake. All you have to do is take off and fly through twenty rings. You can pass through each ring in any direction. Slowly land at the helipad to complete the mission. You have five minutes of fuel. Good luck!" "Awesome, guys. You sure got the hang of flying. You are now free to use the copter whenever you need it. Just access your inventory by pressing START and choose Gyrocopter. One more thing. I could use a good pilot. Come back to see me. I have plenty of jobs on the go. Here, take this. Many thanks, guys." This page was last edited on November 10, 2018, at 09:46.